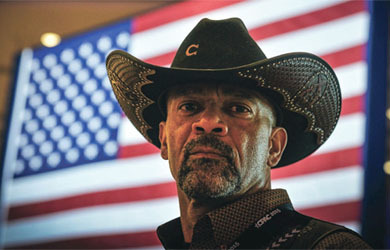 Milwaukee County Sheriff David Clarke, a rising conservative media star and Fox News regular, said on his radio show on Glenn Beck’s TheBlaze Radio Network on Saturday that President Obama is “a straight-up cop hater” and accused the Department of Justice’s civil rights division of being “jack-booted goons” who are lying in wait to go after police officers. Clarke reminisced about the pre-Obama days when, he said, the DOJ was on the side of the police officers, not the criminals. Today, Clarke said several times, the DOJ hates cops. Clarke specifically criticized the civil rights division of the DOJ, comparing it to “some alligator in a swamp, just looking for some law enforcement officer to snag for some minor transgression.” He lamented that politicians “lynched” Darren Wilson, the officer who killed unarmed teenager Michael Brown in Ferguson, Missouri.